Tandoori Chicken: Tandoori Chicken is a popular South Asian (also very popular in UK) dish consisting of roasted chicken prepared with yogurt and spices. The name comes from the type of cylindrical clay oven, a tandoor, in which the dish is traditionally prepared. 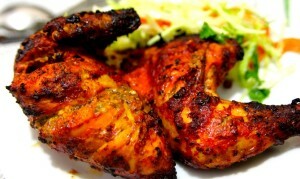 Tandoori Chicken is a dish of Mughlai cuisine. It was popular among the noble families and Nawab families. This dish became popular with the ordinary Muslims of South Asia as the Mughal Empire declined. Wash and clean the chicken and make a slit on the sides of chicken flesh so that the marinade is allowed to penetrate. Now mix 2 tbsp of red chili powder with salt and 1 tbsp of lemon juice and rub it into the slit parts of chicken . Now the main marinade part is mix all the ingredients one by one . Take a large bowl with 4 tbsp of yogurt and add the remaining red chili powder, pepper powder, cumin powder, garam masala powder, turmeric powder, vinegar , lime juice and mix it all together . Now add the chicken pieces in to that and make sure to apply the mixtures in between the slits and add a little oil on top it . Marinade it for over night or 4 hrs. Preheat your oven to 400 degrees Fahrenheit . Cook for 20 to 25 minutes till the chicken is tender by turning it over. After that remove it from oven. Serve with pickled onions and lemon wedges. Adding in red food color to the marinade will give bright red coloring to the tandoori chicken. If you have any queries about this Tandoori Chicken Recipe , please write down in comment box below.